Structural repairs are critical to the well-being of housing – and often to the safety of homeowners and staff, as well. When you have problems with the key structural components in your development -- whether it’s a foundation, chimney, wall, roof trusses, or columns -- call Quality 1st Contracting. Quality 1st Contracting can repair all of your structural problems from footings to roofing. We can also replace rotted and damaged wood. Our structural specialists are on call for everything from temporary shoring to emergency structural repairs. Immediate action can often save you and your community a tremendous amount of money. For problems that involve foundation settlement or related problems, our foundation specialist will work with your association engineer to design the most cost effective and permanent solution. We have the experience to handle difficult truss repairs, as well. Quality 1st Contracting has been making emergency repairs specialist for 22 years. Our emergency staff is available to help you with sudden damage to roofs and siding, including emergency shoring or demolition as needed. In addition, call us to reduce safety hazards due to sink holes. Our technicians also know how to deal with water, with years of experience with leak detection and repair. Some problems creep up slowly, including wet basements and cracked foundations, but they will eventually erode the value of the homes in your community. Our services, including waterproofing and foundation repair, can restore that value and warrant the work for many years. We’re expert at the latest methods, ranging from perimeter basement drainage and pumps with fail-safe backup systems to raising sunken slabs and foundations with piers and jacks. 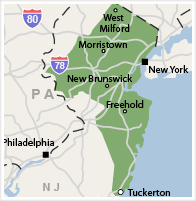 We work in Newark, Paterson, Jersey City, Elizabeth, and nearby. Just contact us for your FREE foundation repair price quote! Quality 1st Contracting was called upon to completely renovate the sign at the Lawrence Township Municipal Building. The old sign was small, wooden and not as sturdy. Project Manager, Kevin, oversaw Quality 1st Contracting Foreman Tommy Orgokowski and his crew to remove the old sign and replace it with a brand new concrete, brick and stucco sign. This sign sits directly on a main highway and is clearly visible and sturdy. This has been a great addition to the town! This garage door in Monroe Township. NJ had taken quite a hit. The homeowners called Quality 1st Contracting to come out and inspect the damage. A brand new garage door was installed and looks beautiful!